I did write in a previous entry that I'm a fan of Turboranger and now I feel like responding to Shogo B'Stard's latest Turboranger post in a certain way. 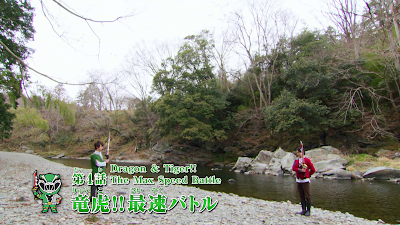 So this post will cover the first two official episodes of Turboranger (which is seldom counted as episodes 1-2 and instead of 2-3 if you don't include the clip show) as well as some of the concepts that were newly introduced that time -- such as an earlier form of "car magic" (mixing magic with vehicles, something that got expanded upon in Gekisou Sentai Carranger) and "teenagers with attitude" just four years before Mighty Morphin' Power Rangers and eight years before Denji Sentai Megaranger. So seriously why has Seelon decided to recruit a team of teenagers with attitude? 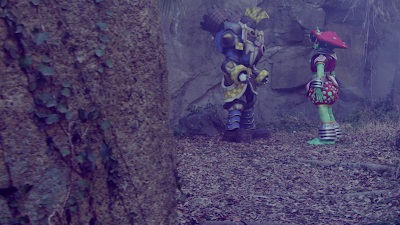 The first two episodes begin with the Turborangers in their Math class. Oh this reminds me of how much I actually hated doing arithmetic back as a teenager -- all the while I actually had a teacher who was like Misa Yamaguchi! The very first episode doesn't begin in a juice bar (and no comic relief bullies to constantly mess with them either or Haruna getting unwanted advances from a school delinquent) but in some classroom setting. I just find it quite weird that Seelon would dare to interrupt a class of five teenagers but there's no time to wait. The rest don't hear her and the five are dragged or teleported into one risky situation -- the three Bouma generals have just recently resurfaced! They arrive on the spot and they witness the carnage that these villains are capable of! So really, why has Seelon chosen teenagers instead of capable ones to fight against the unleashed ancient evil! The Turborangers are taken into Dr. Dazai's laboratory where they learn of the 20,000 year history of the humans vs. the Bouma. It's revealed in the second half of the introductory episode of a dying creature known as Rakia who just got easily forgotten except in one later future episode. For some reason (which was later revealed) -- only the Turborangers can see Seelon! Dr. Dazai must wear that special gadget which really, REALLY should be a burden having to wear that heavy equipment just to talk to fairies. 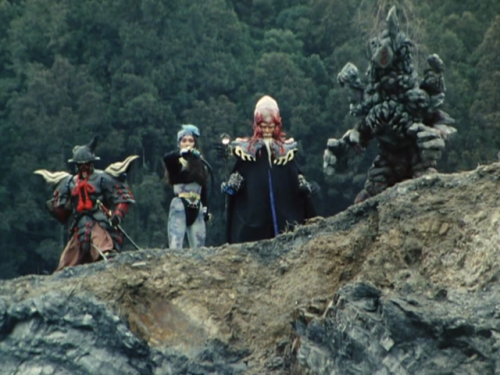 The Turborangers are still unsure of their destiny to fight the Bouma yet they decided to fight anyway. It's also revealed that Rakia's dying state would soon allow the Violent Demon Palace to resurface -- oh boy nice job humanity, nice job in breaking it! Thanks to you a 20,000 year evil is back! Rakia later becomes a star to remind the Turborangers that their work has just begun. After 20,000 years we're finally free -- IT'S TIME TO CONQUER EARTH! The Evil Space Aliens Violent Demon Tribes led by Great Emperor Ragorn have existed to try and destroy humanity. As the villains are released, they do what any good villain does -- cause havoc on humanity! Yes, these bad guys are now free after 20,000 years and they are going to try and destroy Earth! This concept was later ported into Zyuranger with Bandora and her minions getting freed. It was because the Earth's pollution (rather than two random astronauts whose curiosity killed the cat) that the seal of the fairies have been removed. Oh boy, is humanity REALLY the biggest villain here? The Bouma arrive to unleash their attacks against humanity without second thoughts. This makes me think why are teenagers chosen to fight these bad guys? Don't they have to STUDY? Not to mention, teenagers aren't exactly the best candidates due to raging hormones and that they still have to face puberty and their own fickleness. But they got into the mess anyway which really has me thinking -- was this show actually intended to inspire a generation of teenagers who are about to quit because of hardships? Maybe one can view the Bouma as a symbol of certain obstacles you have to pass through in high school -- such as subjects that you're not good at or for worse, bullies that will always be there to harass people. Yes, the Bouma are indeed bullies against humanity but I think a lot of people deserve what the Bouma are doing. Yet it doesn't justify what the Bouma does either in what they're doing with their mostly really stupid plans to conquer Earth. I could also talk over and over again about just how I thought Ragorn is one scary villain even if I first saw him under the Tagalog dub! Yes, I remembered this guy gave me nightmares -- he was one freaking huge set! The fact he really looked so scary and he had some extra arms from his creepy throne to punish his minions whenever they fail isn't a joke. You can think of how this guy comes out like this, "After 20,000 years it's finally free -- it's time to conquer Earth." He spares no moment to launch some attacks though later on, we'd be stuck with the mandatory (at least for the plot) idiotic plans to take over the world. Years later, I ended up watching more of the original Japanese and figured out he was voiced by the late Takeshi Watabe. He was the voice of the Creation King in Kamen Rider Black, Don Horror in Space Sheriff Gavan and Emperor God Neros in Chojinki Metalder. Hmmm that would give you a good reason to even fear him more, right? The fact that there's more than one person in the set is an amazing feat. People behind Ragorn could make the extra arms move or just do whatever functions needed for this rather complex set villain. Now I'd like to think about how super hero shows tend to screw logic. How on Earth do the heroes learn to pilot the mecha in such a short amount of time? It reminded me of how Hirohisa Soda's previous installments doesn't answer that question. Goggle V and Dynaman just made the heroes pilot everything with ease. Bioman does explain things a bit with their electron brain implanted in their suits. 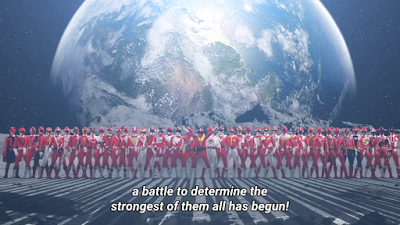 But Turboranger? I really find it funny (in some way) how the "let's just screw logic" scene and have the Turborangers learn to drive their vehicles. I wonder did they already get their driver's license or what? 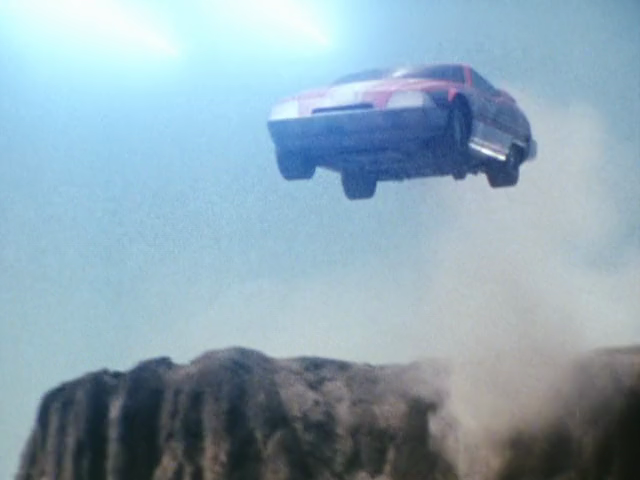 What's even funny is that Red Turbo pilots the Turbo GT with ease -- including the FLIGHT mechanism in the first episode. Hmmm I wonder if he could pilot a regular plane? This was somewhat corrected in some later installments but not always. 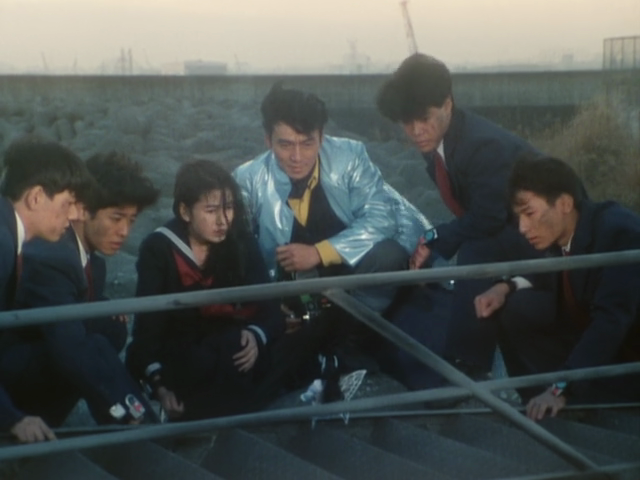 Jetman did try to correct it with the episode where the other four struggle to use the Jet Birds but how did Aya-Chokan get them to learn just in time? Megaranger did somewhat explain stuff -- it's because they have a computer game based control system that allowed them to plot their mecha. Others use mental energy or others have sentient mecha which piloting it is a cooperative effort. Turboranger still was testing things out and it may have been an oversight that was corrected in later installments. Yet, it's that screwed up logic that makes some shows fun to watch. Just screw logic and enjoy the show folks! I really love how the actions both in-suit and out of suit really blend. It also shows the Turborangers aren't super teenagers either -- they've taken a beating and they need to learn to fight. So I just want to ask when's Shout! Factory going to release Turboranger on DVD?